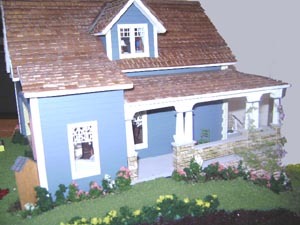 I originally built this house in a Debbie Young workshop in 1998. 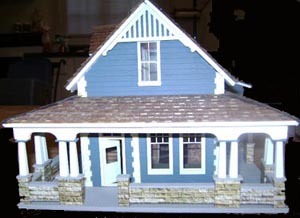 Debbie based it on an actual house in Nevada City, California, but it always reminded me of a house I used to see when visiting the North Carolina mountains. 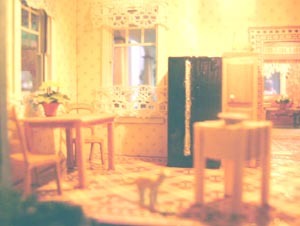 Back in 1998, I had not only built the house, but completly wired and wallpapered it. 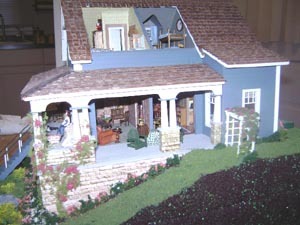 Then it sat in a box with all the furniture, kits and accessories I had bought for it, thought many years and two house moves. Now, it's completed! Since it reminded me of a house in the mountains, I made a hilly base for it to sit on. It has a high foundation in the front, but sits on the ground in the back. It's a long climb up those stairs, but quite worth the visit. 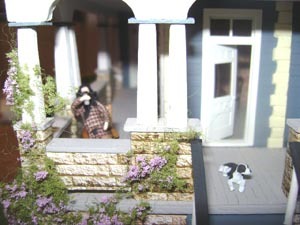 Once up on the porch, you'll meet the owners and their friendly dog. 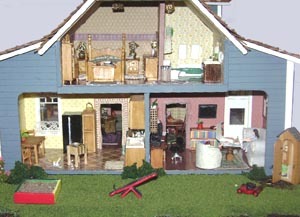 Then you might want to take a tour around the house. The right side of the property is a steep climb to an arbor. 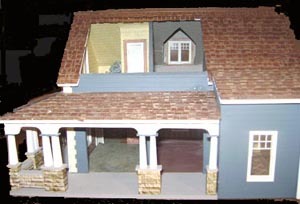 The wrap around porch offers several separate sitting areas. 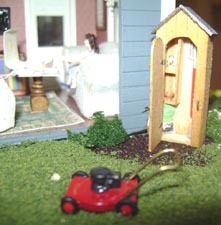 The back yard has a sandbox and seesaw for the kids, and a toolshed for the gardening supplies. On the left side of the house is another steep hill back down to the front yard. 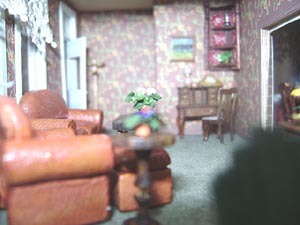 The comfortable living room features a leather sofa and chair, along with a lovely desk by Sue Holtge. 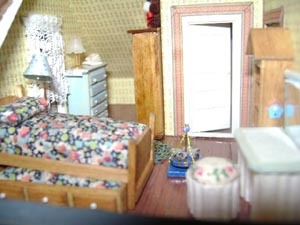 Upstairs, the girl's room features a trundle bed from another Debbie Young kit, along with other furniture and toys. 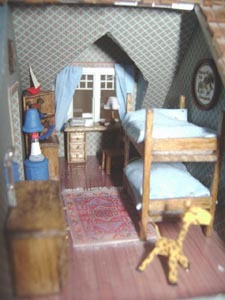 The boy's room next door has bunk beds, a dresser, desk and corner hutch, all from a Debbie Young kit, plus an assortment of toys and a unique lighthouse lamp. Back downstairs and around back, we visit the sunny kitchen. Be sure to pet the cat! 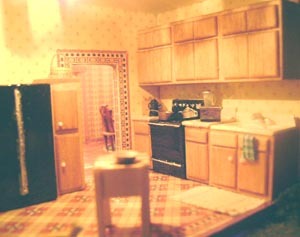 Stove, fridge, sink, table and chairs from a Debbie Young kit. 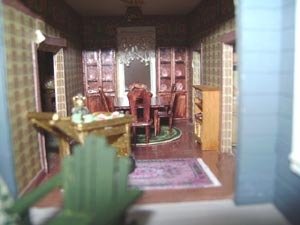 Other cabinet by In A Miniature Manor. Butcher block by BJ Minis, and cat by Barbara Myers. Technology reigns even in a mountain house! 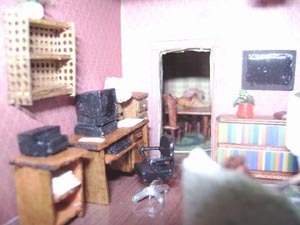 Computer set and furniture from a Debbie Young kit. At the right, the kids enjoy pizza while watching TV. except secretary desk by BJ Minis. 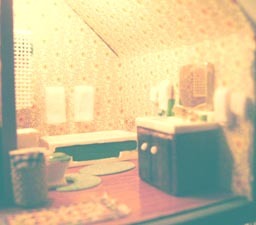 The bathroom completes the upstairs. 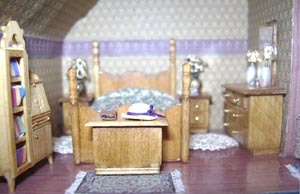 Made from a Debbie Young kit, with various accessories added. Hope you've enjoyed your visit!